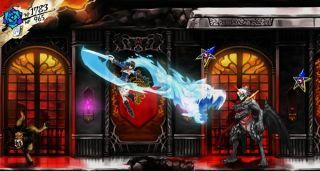 Longtime Castlevania producer Koji Igarashi is seeking Kickstarter support for his latest project, a 2.5D "exploration-focused, side-scrolling platformer" called Bloodstained: Ritual of the Night. Bloodstained casts players as Miriam, an orphan afflicted by the Alchemists' Curse that's slowly crystallizing her skin. Now, summoned by her friend Gebel, she must battle her way through a "demon castle from hell"—but Gebel's humanity has been stripped away by the magi-crystal curse, which means he's attempting to bring about nothing less than the downfall of humankind. Of course he is! Igarashi, who left Konami in 2014, is developing the game with Inti Creates, one of the studios working on Keiji Inafune's Mighty No. 9. The team is seeking $500,000 on Kickstarter, and it's a lock to happen: The campaign launched just a few hours ago and, at time of writing, already had more than $200,000 racked up. For $28, supporters will net a digital copy of the game, while a pledge of $60 or more will take home a physical copy. Stretch goals currently go up to $850,000, which will see David Hayter, the voice of Solid Snake, join the cast as Gebel. The decision to go with a 2.5D style was motivated by a desire to explore its potential "within the classic Igavania formula," but the campaign promises that the game will maintain "that classic style" that fans have come to love. "Games like Guilty Gear and Strider are proof that 2.5D can be handled in a way that honors a classic aesthetic while allowing for new possibilities; that’s what IGA hopes to achieve with this project," it says. "And of course, since it's an Igavania game, the 2D gameplay and feel are nonnegotiable." The Kickstarter runs until June 12, and right now there are only two questions: How fast it will hit its goal, and how far it will move past it. I suspect the answer to both is "very." Update: As predicted, the Bloodstained Kickstarter surpassed (and by "surpassed," I mean, absolutely crushed) its funding goal in mere hours. The campaign waved goodbye to $600,000 just moments ago, and yes, that's $100,000 past its goal in less than three hours from the time we noted that it wasn't quite halfway there. I'd expect an announcement of more stretch goals (a lot more stretch goals) very soon.